​Recognized as a world class destination for whitewater recreation, Ohiopyle State Park, is not (yet!) known as a high quality resource for the growing sport of mountain biking. The new Ohiopyle Biking Club (OBC) is dedicated to converting this vast potential for “Destination-worthy” single track into a reality for all to enjoy! 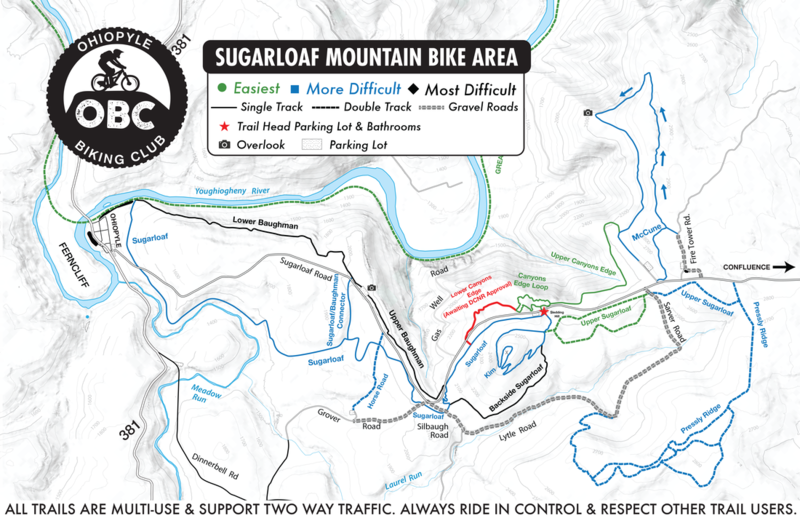 OBC’s vision includes a mountain biking “hub” at Sugarloaf parking/pavilion area with enough miles of quality single track that a weekend visit to Ohiopyle might mean never biking the same trail mile twice. Multiple loops, as well as trail connectivity between the Falls area and Sugarloaf and the summit of Laurel Ridge are in various stages of construction and planning. ​Weekly volunteer work parties and/or rides make for a fun opportunity to exercise and socialize with other area mountain bikers, as your schedule permits. The club currently maintains over 10 miles of single track available to bikers like you! And we are approved to build more this year! Every Wednesday is Trail Wednesday in Ohiopyle. We meet at the Sugarloaf parking lot every Wednesday at 5:30pm. Some weeks we do trail work, and others we do group rides. Like us on Facebook or join our mailing list to stay up to date on all of our events.